EXCEED AND EXCEL (AUS) (Bay 2000-Stud 2004). 7 wins-2 at 2, VRC Newmarket H., Gr.1. Champion Australian Sire 2012-13. Sire of 1859 rnrs, 1306 wnrs, 150 SW, inc. Excelebration (Deauville Prix Jacques Le Marois, Gr.1), Overreach, Guelph, Mr Stunning, Earthquake, Margot Did, Amber Sky, Flamberge, Helmet, Reward for Effort, Outstrip, Sidestep, Fulbright, Best Terms, Heavy Metal, Priceless, Championship, Kuroshio, Masamah, Wilander, James Garfield, etc. TAKING AIM (g. by Choisir). Winner at 2, A$244,800, HK$393,000, in 2016-17, GCTC Ken Russell Memorial Classic, Gr.3, 2d BRC Sires' Produce S., Gr.2, VRC Talindert S., L, ATC TAB Rewards 2YO P., 3d BRC JJ Atkins S., Gr.1, HKJC HKU Space H., Riding for the Disabled H., 4th VRC Danehill S., Gr.2. Witherspoon (f. by Exceed and Excel). Winner at 2, A$100,555, in 2017-18, 2d ATC Rosebud Prelude 2YO H., 3d BRC BJ McLachlan S., Gr.3, Calaway Gal S., L.
Manuel (g. by Commands). 6 wins to 1400m, A$334,450, to 2018-19, SAJC M&J Chickens Autumn Series H., MRC Pegasus Leisure Group H., SAJC Hughes Limousines H., Junction H., 2d SAJC Schweppes 2YO H., VRC Grinders Coffee Roasters H., SAJC Murray & Barb Stewart H., Barry Simpson H., 3d ATC Inglis Sprint, 4th VRC Maribyrnong Trial S., L.
GIRL HUSSLER (Hussonet). 5 wins. See above. Sweet Suitor (Bachelor Duke). 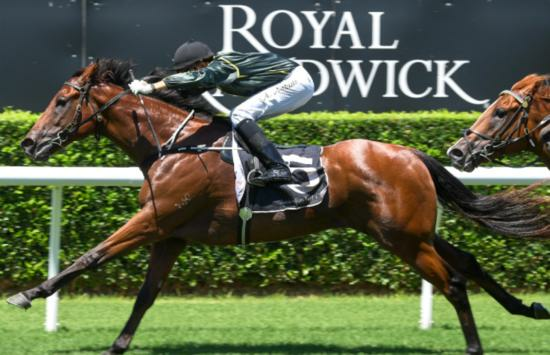 4 wins at 1200m, NZ$137,325, A$2,155, ARC Gucci H., BOP RC Morton Estate Sparkling H., ARC NZB National Sale 3YO H., 2d Cambridge Breeders' S., Gr.3, ARC Bonecrusher S., L, Mr Tiz Trophy, L, Radio Live H., Whips n Spurs in Cuvee H., Bayer 2YO H., Waikato RC Classic Hits 98.6 H., 3d Counties Bowl, L, BOP RC Gartshore Construction H., 4th Waikato RC Foxbridge P., Gr.3, ARC Newmarket H., L.
Shine on - Just Shine (Aust.) (Mastercraftsman). 5 wins from 1600m to 2000m, NZ$1,450, A$210,305, to 2017-18, ATC Tahiti Travel Connection H., Wallaby Cup H., Tab.com.au H., 2d ATC Destiny's Kiss H., 3d Newcastle Gold Cup, Gr.3. PLAYFUL FINGERS (Defensive Play). 5 wins-3 at 2-at 1000m, 1200m, NZ$76,562, ARC Champagne S., L, Wanganui JC Waikato Stud S., L, 3d Hawkes Bay Gold Trail S., Gr.3, Masterton RC Lowland S., Gr.3. Producer. CLEVER ZOE (Pompeii Court). Winner. See above. RITZY LADY (Zabeel). 6 wins from 1400m to 2500m, NZ$127,925, New Zealand St Leger, L, 2d Counties Cup, Gr.2. Producer.